Designed to commemorate the Portland Timbers 2015 MLS Championship win and launch of the Reigning Champ Champions Pack Collection. These handcrafted wood spray paint cans are limited to only eleven (11) units and were on display alongside the Major League Soccer Cup Championship Trophy during a one night only pop-up art gallery. Check out the video below for the recap. Big thanks to Kicks To The Pitch for the video production and event planning. Portland was coined Stumptown during a period of phenomenal growth after 1847. The city was growing so rapidly that the stumps of trees cut down to make way for roads were left behind until manpower could be spared to remove them. In some areas the stumps remained for so long that locals whitewashed them to make them more visible during heavy rain. They also used them to cross the street without sinking into the mud. The logging industry of the northwest eventually spawned a tradition amongst the Portland Timbers and their fans. 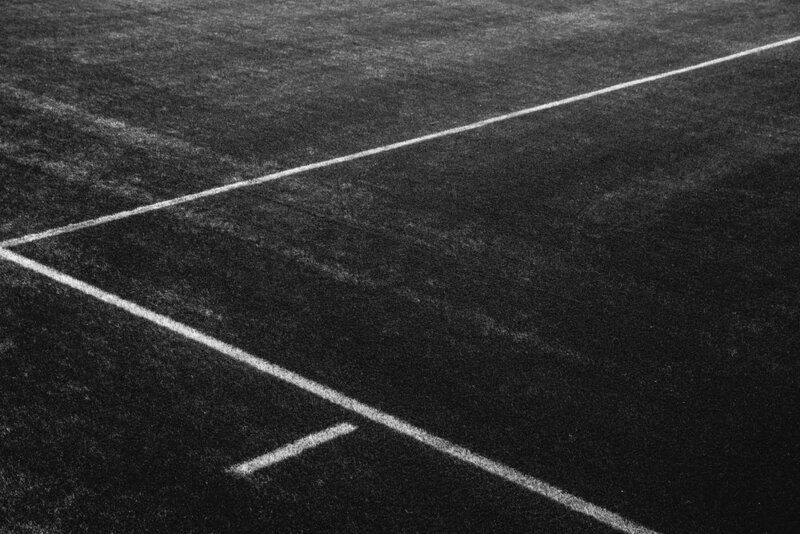 Known as the “Victory Log”, Portland Timber’s mascot began cutting a slab from the log every time the Timbers scored a goal. Inspired by this rich history and tradition, each of the eleven limited edition spray cans are handcrafted from locally sourced and sustainable, hard-rock maplewood and feature a uniquely designed interior that simulates the rattle of a real spray paint can when shaken. Each of the eleven (11) spray paint cans are whitewashed by hand with a water-based finish and wrapped with laser-engraved artwork. Each of the eleven (11) spray paint cans are individually signed and numbered. The line features a t-shirt, crewneck, sweatpants, and track jacket all incorporating elements of the club with the signature style of Reigning Champ. 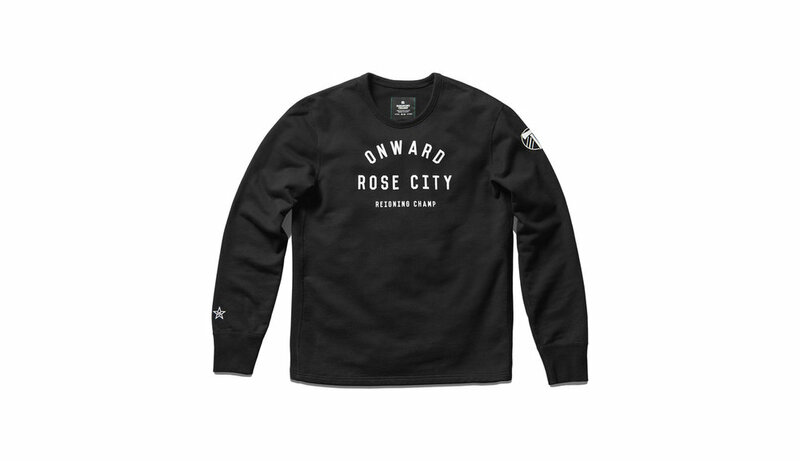 The Timbers' playoff mantra, "Onward Rose City" was screen printed on the t-shirt and sweater along with green stitch detailing across the neck labels. The look book featured Portland Timbers defender Alvas Powell and was photographed at the Timbers stadium in Portland, Oregon. 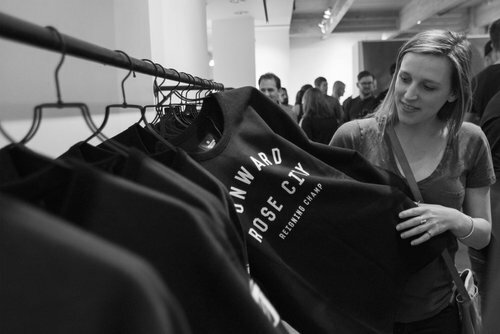 Held at an art gallery in downtown PDX, the launch party gave supporters an opportunity to meet the Portland Timbers teams and purchase the gear before it went on sale to the public. The MLS Championship Cup Trophy was on display alongside the custom, handcrafted Reigning Champ x Portland Timbers MLS Champions Pack Wood Spray Paint Cans. 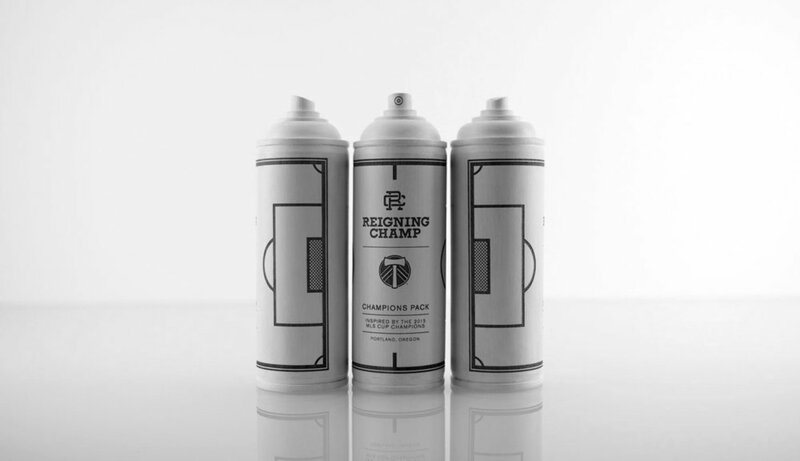 Use the links below to learn more about the collection and the one night only pop-up art gallery featuring the Reigning Champ x Portland Timbers MLS Champions Pack and these limited edition handcrafted wood spray paint cans.